It’s Been Four Years and Where Are We? As we enter a new fiscal year, Canadians should take stock of where we are now and what has changed over the last four years. To date, we’ve seen stagnant wages, low business investment, and a rising national debt that doesn’t seem to be dropping any time soon. Last year the Liberals spent $23 billion servicing the national debt alone. Canada’s debt will soar to over $705 billion this year or $50,166 per Canadian family. What does that mean? The current government will be spending more on debt interest than we currently spend on health transfers. And of course, more debt today means higher taxes tomorrow. Last year, Canada’s net debt reached an all-time high of $670 billion or $47 612 per Canadian family. Let’s look at the numbers. The average Canadian household is spending an additional $1715 annually on interest payments compared to pre-July 2017. 48% of Canadians are within $200 of not being able to pay their bills and debt obligations. 10% of Canadians are within $100. 33% have no money left at the end of the month and are unable to cover their payments. They are falling further into debt. 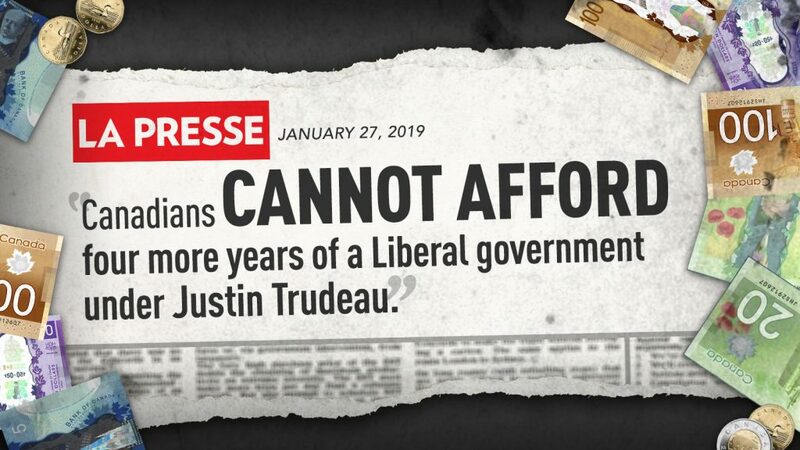 According to a Fraser Institute report, the average Canadian can expect a tax increase of almost $2000 a year, roughly the same amount that this government brags is credited to families through their Child Benefit and Middle-Class Tax Cut. Is it really a credit or tax cut if the impact is a net zero benefit? Business investment also plays a significant role in our country’s current state. To placate the energy sector, the government announced a $1.6 billion loan to oil and gas companies to invest in areas of the sector that have nothing to do with the problem at hand—a lack of pipelines and regulatory overkill. Rather than take direct action on pipelines and competitiveness, the Liberals are choosing to focus on ideological issues. It’s the equivalent of breaking a water pipe and hiring a contractor to fix your furnace. Alberta needs more pipeline capacity and less regulatory burden. This government’s own 2018 Budget states “…with very little spare capacity, the impact of unexpected pipeline or refinery shutdowns could become larger, resulting in increased volatility in prices for Canadian producers. This situation is expected to prevail into 2020 until major pipeline projects…become operational…” Their 2019 Budget confirms that this record has continued! So why are we throwing money we don’t have at the wrong issue? Because it’s more politically expedient to pretend rather than make political waves by getting pipelines built. All of this to say, we have to ask ourselves one question: are we any better off than we were four years ago? The answer, broadly, is no. Alberta is facing one of the worst rates of job growth in the country, with one of the highest rates of unemployment and a struggling business sector. The Prairies have had enough talk of change; it’s time to start doing it.